It’s become tradition around here. For several years, I have shared a list of our family’s favorite games, adding to the list each year as our shelf fills more and more. Welcome to this year’s Favorite Family Games List! I LOVE that each year, you share your family’s favorite games in the comments. This has helped us decide which new games to get for our kids each Christmas. So keep the comments coming! Read through this list, then add your favorites in the comments section to give us all more idea! I love that many of these are small enough to put into stockings. I love that these are gifts the entire family can enjoy together. And I love that there is really no end to all the great games out there! Ok, your turn! 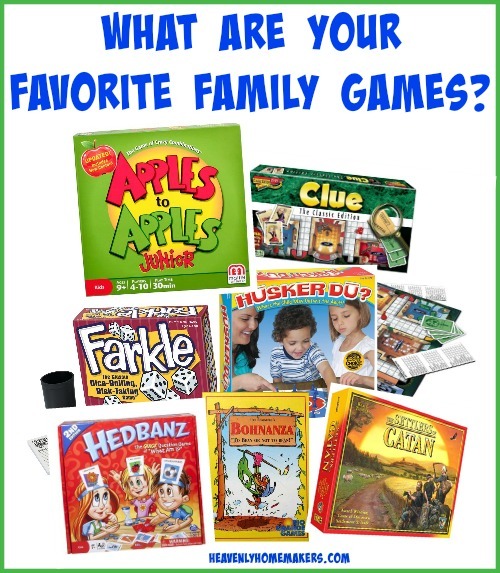 Tell us what your favorite family games are! Many of these links are my affiliate links. I was introduced last year to Exploding Kittens. I thought the name sounded kinda… weird… and I was resistant to play it at first. But it was fast to learn and quick to go through a round, and I enjoyed it a lot! I even bought my own version. I learned from a 8 and 10 year old, who both enjoyed it, as do the many adults I’ve played with. Glad you’ve discovered Anomia! It’s one of my perennial recommendations. Our kids span from 3-9, so we play lots of different styles of games. Another of our favorites is Mmm! – a cooperative game that’s unfortunately a little hard to get in the US. And if your family likes Apples to Apples, you might also like “Bring Your Own Book”. It has similar gameplay, but instead of finding the best answer on a card, you look through a book (any book) until you find something that might match the prompt. It can be hilarious, depending on the books you use. For the second year, my husband and I put together a “recommended” list of games on our blog for many ages and many different styles of play. Everyone is represented, from toddlers to 2-player adult games. I hope you’ll check it out! We enjoy many of the games on your list, and I count Yahtzee as school since they are practicing their math. The little ones have to add, the older ones have to multiply. Trivia is also a favorite with my husband and I. Another game we really enjoy is Who Am I? We play it almost every weekend and it doesn’t require a game board or anything else. We mostly play Disney characters and recently bought a book called Disney Who’s Who that helps us think of new & different characters. The way we play is someone chooses a character and then gives a clue about the character. The rest of the family asks questions about the character, like “Are you male or female?” “Are you an animal or a person?” “Are you in a Princess movie?” And so on, until someone guesses the character, or everyone gives up. We also sometimes play with historical figures. Walt and Roy Disney have come up in our Disney version several times. Our family really enjoys the card game Five Crowns. My kids love it and we enjoy it as well. My eight year old can even play it and is actually really good. It doesn’t require hours of commitment, tons of brain power or stragety…just a good family game that you can play while you drink a cup of coffee and chat. Five Crowns sounds great! I put it on my list to order! We like Apples to Apples, Bible Edition, and our 7 yr old enjoys it as well. The boys also like Stratego. One for younger kids is Sneaky Snacky Squirrel Game, and one for older kids and adults is Fluxx. We discovered the jewel merchant game Splendor, and have really enjoyed it. There is strategy involved, but you can also have a casual chat while playing. Our family loves “Things”. We always end up cracking up during that game! We are a game family too. There are so many we like. A few we would add to your list are Bang, Sushi Go Party and Quixx. Have you tried Qwingo? I actually like it a little better than Qwixx. There’s only one die. On your turn, you name a number from 1-100 and roll the die. Then everyone puts the number + rolled symbol on their paper, bingo-style (numbers in ascending order, of course). First person to fill a column wins. My friends husband designs games and has some great ones. Lanterns and World’s Fair are 2 to check out. Those are both great games! Such a great list of games. I will have to check out Anomia. We love to play Uno, quiddler, and many more. I love using games as learning. My middle kids are finally reading well enough to play games that require reading, and I’m so excited to play more! For the longest time it was just my husband, our oldest and me, and there’s a lot of games you CAN’T play with three people! Jokers marbles is one of our favorites. My boys are younger (4 and 5) but they really enjoy Hi-Ho-Cherry-O! and Candy Land in addition to some of the others you named. Learning games we love Lets Jet, Bank It, and Ticket to Ride. For family fun for all to race around the house…Family Scavenger Hunt. Card games never go out of style….Dutch Blitz, Mille Bornes, Flinch,Uno and then regular deck of cards…Slap Jack, War, Clock….We have an entire book case and more shelves scattered around the house with games….we are a BOARD game family who just loves to play. Try taking a deck of cards with you to restaurants and waiting rooms. Yay! Pass the Pigs!!! Our all time favorite! A couple more that we love are Bowling Dice which is good for all ages and no skill required… that’s what makes it fun. Also a game that is not as easy to find is Herd Your Horses by Aristoplay. Definitely a must for those horse lovers, my kids love it and there are quite a few variations to play. Love so many on your list. Two faves not on your list are Bananagrams and Quiddler. We love games, too. I look forward to your list every year for new ideas. I, too, highly recommend Splendor!!! Between Two Cities is a new family favorite. Scotland Yard is also fun. I’m right there with you on the quelf! I discovered celestia, labyrinth, and wackie 6 to be amazing games. We’ve been enjoying Sumoku lately. It’s like scrabble but with numbers instead of letters. Qwirkle is one of our favorites.